The action begins with Carlo Gabriel, a hip, African-American Mexican-American St. Louis police detective — with a secret of his own — who is trying to find Jonathan Stone, a missing English professor who teaches at a local university. The people Carlo interviews and expects to be most cooperative in his investigation — Stone’s English department chair, the missing man’s wife and her boss, the mayor of St. Louis — all give off vibes that tell Carlo this is more than a case about a husband-gone-missing. Carlo risks his life to follow a trail of corruption and deceit that implicates some of St Louis’s prominent citizens, thus dangerously exposing individuals who often get away with murder. The trickle down effect of this malfeasance adversely hurts the most vulnerable citizens– at-risk students and young people. Without giving too much away, FAIL is an important book. 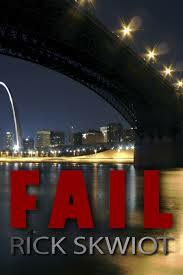 There is a twist to this urban story, and what readers learn about failing is not what they might expect.